OUR LANDS IN OUR HANDS! Land Stewardship is the key to keeping our lands in our hands. 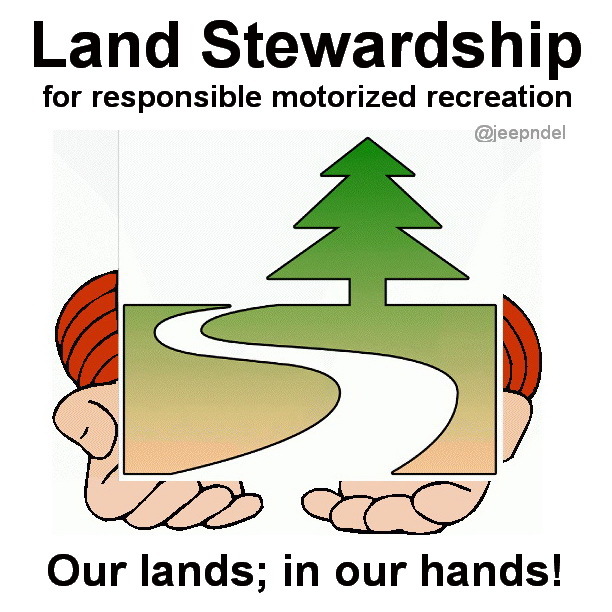 What does "land stewardship" really mean? In simplest of terms it means caring, responsible management and use of our lands. If we do not take care of our playgrounds, "they" will be glad to take them away from us. There is no better way to keep motorsports alive and trails open than to be a good steward of whatever lands you have to play on. Enjoy yourself; have fun; challenge your rig; ride hard; ride smart; wheel with friends; pack out your trash; set the example; and remember -- Our Lands; in Our Hands.